I am the kind of person who would rather see something be made than be told how to make it, so I have been doing LIVE recipe videos from Facebook…and it has been so wonderful to connect with others! 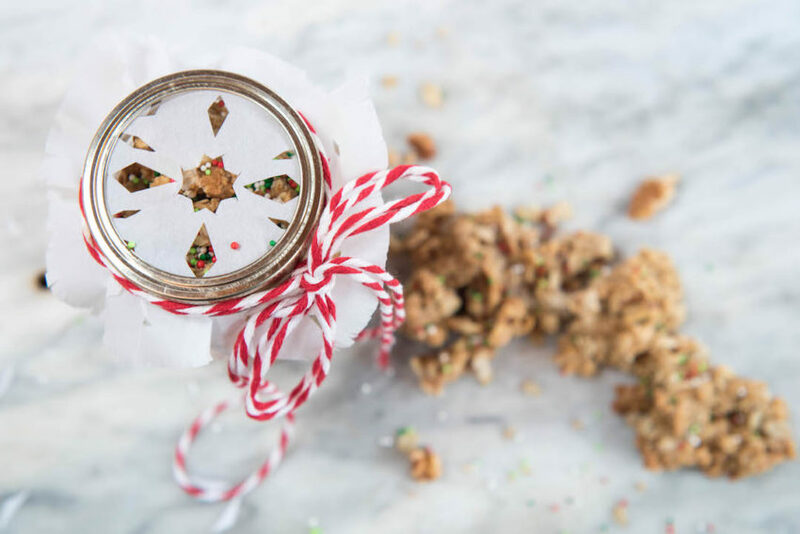 The secret to making it taste like the granola was made from sugar cookies is this: pure almond extract, and a really good protein powder. And, if you’re up for it, a small sprinkle of festivity at the end…. It’s delicious with warmed coconut milk or cashew milk poured over. As I’m writing this, I have 3 baking sheets of it on my counter, the snow is softly falling outside, and that bowl of winter comfort is calling me! 2. In a medium sized bowl, whisk together maple syrup and peanut butter. 3. Stir in extracts, salt, then oats and walnuts, until the mixture is evenly coated. Pour on coconut oil and stir. Finally, add protein powder, and fold it in until it has fully coated the mixture. Pour ingredients onto a flat baking sheet covered with parchment paper (this makes for super-easy clean up! ), and make sure mixture is in a single, even layer. 4. Bake for 30 – 35 minutes (bake it a little longer for more crunchy granola, a little shorter for more chewier granola). 5. 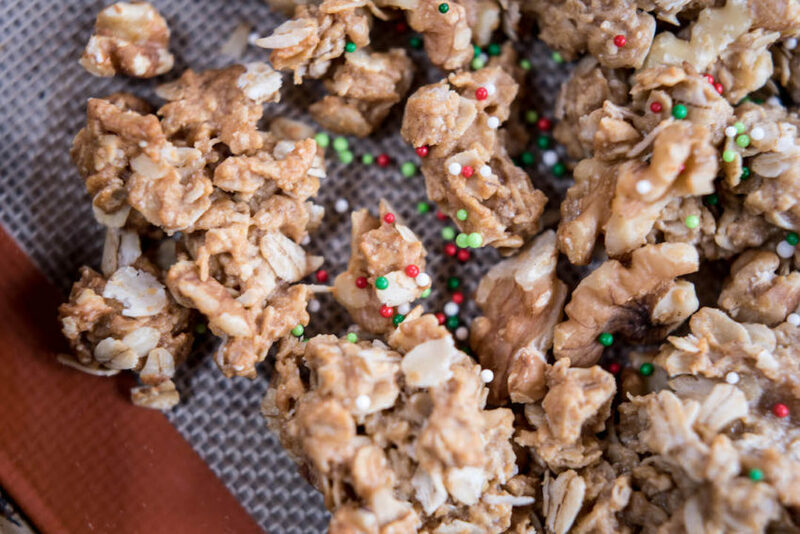 Remove and let granola cool, then break into bite sized pieces and store in an airtight container. Thank you Tina!!! Please let me know what you think, and make yourself at home here! Big hugs! 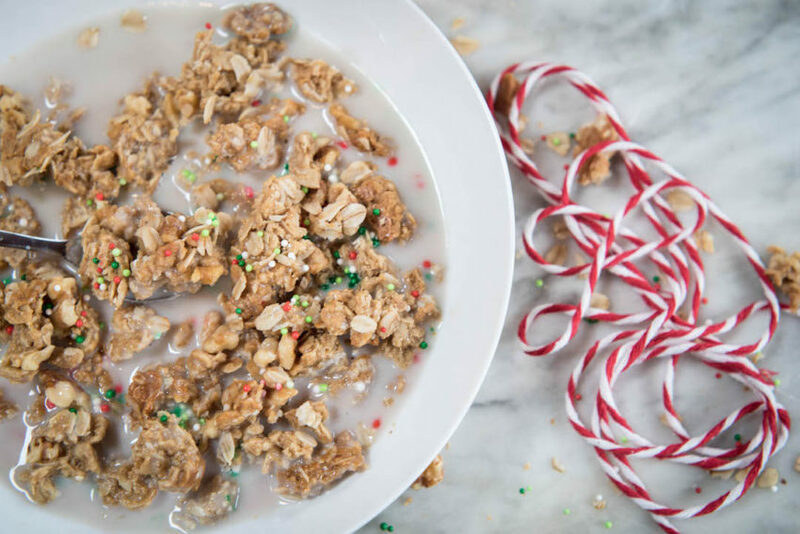 Love, Love this granola!! I have made it several times and it is delicious. I have shared it with friends and they enjoyed it also.